This text provides a comprehensive, contemporary review of this disease and serves as an important resource for clinicians and researchers with an interest in medullary thyroid cancer. 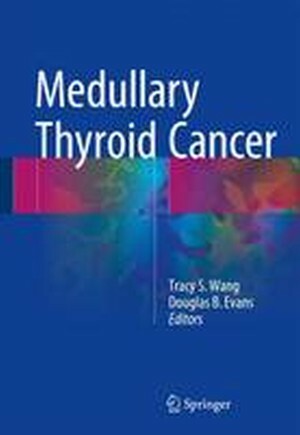 The book reviews the initial management of the patient with thyroid nodules, including risk factors, appropriate genetic evaluation of suspected/known medullary thyroid cancer, and appropriate screening for diseases associated with inherited forms of medullary thyroid cancer, including primary hyperparathyroidism and pheochromocytomas. It includes an in-depth discussion of the optimal surgical management of patients with sporadic and inherited disease, those with locoregional metastases, distant metastases, and recurrent medullary thyroid cancer. The long-term follow-up and management of patients with medullary thyroid cancer is highlighted. Medullary Thyroid Cancer will serve as a useful resource for all providers and researchers interested in this relatively rare and challenging malignancy. It highlights recent guidelines for the management of patients with medullary thyroid cancer and discusses controversies within the literature. All chapters are written by experts in the field and incorporate multiple disciplines, including Surgery (Endocrine Surgery, General Surgery, and Otolaryngology), Endocrinology, Radiology, Medical Oncology and Genetic Counseling. History and Epidemiology.- Cytology and Pathology: Pitfalls and Challenges.- Initial Evaluation and Diagnosis of Medullary Thyroid Cancer.- Molecular Mechanisms of Disease: The RET Proto-Oncogene.- Genetic Evaluation of the Patient with Medullary Thyroid Cancer.- Preoperative Evaluation of Medullary Thyroid Cancer.- Surgical Management of Inherited MTC: Prophylactic Thyroidectomy.- Surgical Management of Inherited MTC: Therapeutic Thyroidectomy.- Surgical Management of the Parathyroid Glands in Patients with Inherited MTC.- Surgical Management of Sporadic MTC.- The Role for External Beam Radiation Therapy.- Management of Patients with Metastatic MTC.- Emerging Therapies for Progressive Metastatic MTC.- Follow-Up and Surveillance of Patients with MTC.- Surgical Management of Recurrent MTC.